The various authors of the New Testament find themselves at odds with many proponents of the church growth movement on one important point: the ability of man to listen and respond to the Gospel of Jesus Christ. It takes more than simply finding an individual’s felt needs to convince them of the truth; it takes a sovereign act of grace. The only target audience to receive the Gospel is the audience God Himself has targeted. 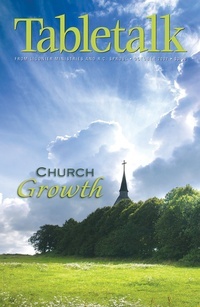 The theme of the October 2007 issue of Tabletalk focuses on church growth by exploring the proper means through which the church grows, the principles of which are found in Scripture, not in clever programs or manipulative preaching on felt needs. Contributors include R.C. Sproul along with Mark Dever, Ligon Duncan, Cornelius Hedgman, Carl Robbins, R.C. Sproul Jr., and Gene Edward Veith. Tabletalk features articles about topics central to the Christian faith and daily, in-depth Bible studies.